Contributed by Natalie Huebel, 22 years old and a student at Texas A&M University. Due to the oil and gas industry plummeting in 2016, my dad lost his job that he had for over 30 years, right before I was about to leave for college. I couldn’t help but feel an overwhelming sense of guilt and anxiety for the duration of that summer. In addition to this, I was unhealthily dwelling on all the new transitions that were to shortly come. Having to live on my own, find a new group of friends, and ultimately, adjust to the course load that university was going to demand of me were all weighing heavy on my mind. I was mindlessly listening to music one night when a particular lyric caught my attention. 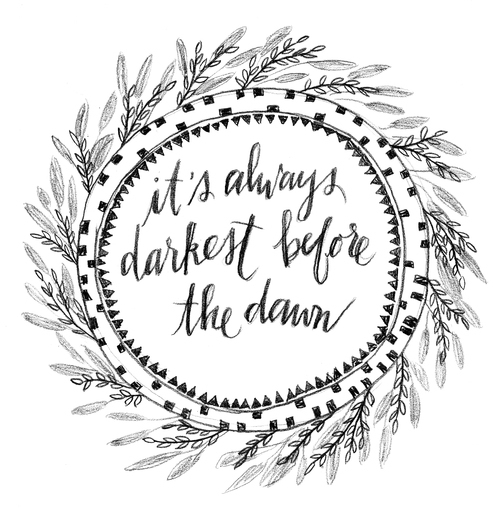 “It’s always darkest before the dawn,” from Florence + the Machine’s “Shake It Out” quickly resonated with me upon hearing it. Hearing these words at this time of my life helped me realize that just because things seem difficult and unbearable at the time, it doesn’t mean that they will always be that way. Hearing the right string of words at the right moment can have a profound effect and I am thankful that the Humanities celebrates such moments. Natalie Huebel, 22 years old and a student at Texas A&M University.